As a part of the CIAA Tournament, TreesCharlotte is pleased to partner with the Toyota Green Initiative in the promotion of sustainability in African-American communities. Make a change by donating time to revitalize the Johnson C. Smith University Sustainability Village Garden with gardening activities and tree seedling preparation. In addition to gardening activities, help is needed to prepare seedlings to be given away at outreach events around Charlotte. This is a great opportunity for groups or organizations and for anyone needing school community service hours; appropriate for anyone ten years or older. 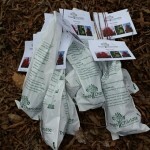 Volunteers will soak seedlings in water, wrap them in newspaper, and place them in a bag. Seedlings are bare root and very messy. Come prepared to get dirty.